Singer has been in the sewing-machine manufacturing industry for 160 years. Singer sewing machine models are known to be leaders in reliability and technological advances. If one is to search for the best sewing machine for various purposes, Singer sewing machine models are bound to appear on the search engine. Singer sewing machine models are very varied. Due to Singer’s dedication to creating the perfect sewing machine for each level and purpose of its users. Singer sewing machine models had gone through various changes as it rode the tides of time and continuously innovated sewing machine mechanisms to make sewing easier for all kinds of tailors. For every need there may be, Singer has it covered with every model that they have. The price range is also wide, with varying capacities, pre-installed stitches, mechanisms, and chassis’ material. The varied models are promising, assuring that they’ve got one machine perfect for every need a tailor may have. However, making the choice could be hard. If you’re looking into Singer’s wide range of models for your next sewing machine but aren’t quite sure of what would be perfect for you and your needs, we got you covered. We will introduce two models in this article and compare and contrast each against each other. This may or may not be the perfect model for you, but it would allow you to see features and other aspects that you may look into Singer sewing machine models to find your perfect match! 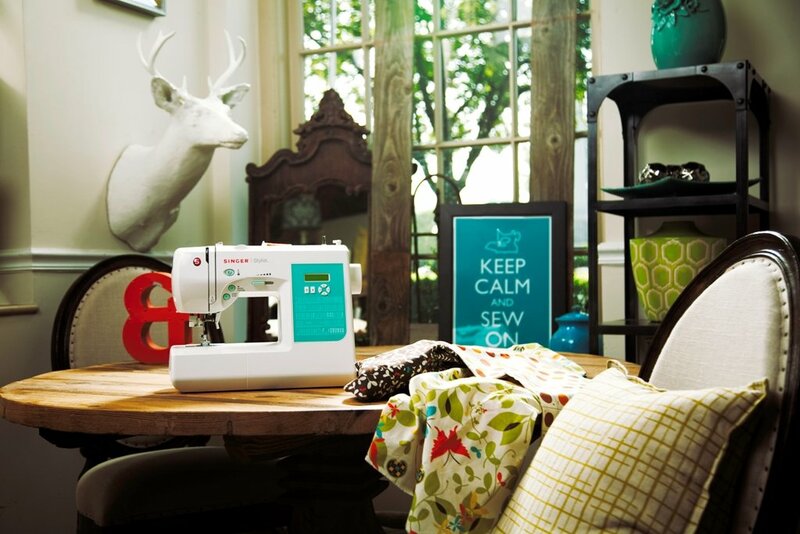 Ever heard of Singer 9960 Quantum Stylist and SINGER 4423 Heavy Duty Extra-High Sewing Speed Sewing Machine? These are two great Singer sewing machine models. We chose both models due to their contrasting characteristics. First off, we’ll talk about Singer 4423’s features, highlights and cons, before Singer 9960’s. At the end of this article, there’s a brief summary of whom each machine is best for. Singer’s website describes this as “a true workhorse”. 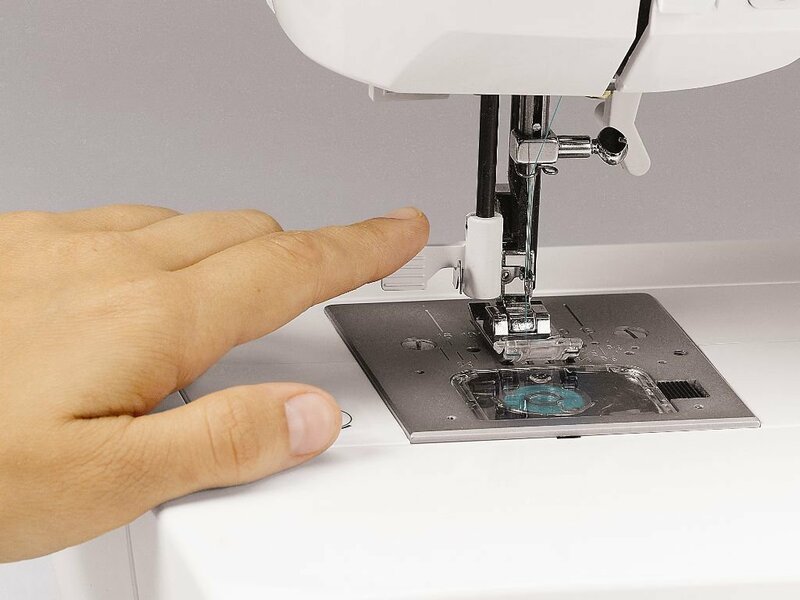 This sewing machine definitely has the strength and stamina to withstand even the most difficult projects, and it does give a new meaning to the word “heavy duty” in the world of sewing machines. This model is a manually operated 12in x 6.2in x 15.5in sewing machine that weighs approximately 14lbs and could stitch a whooping 1100 stitches per minute with a maximum stitch width of 6mm. 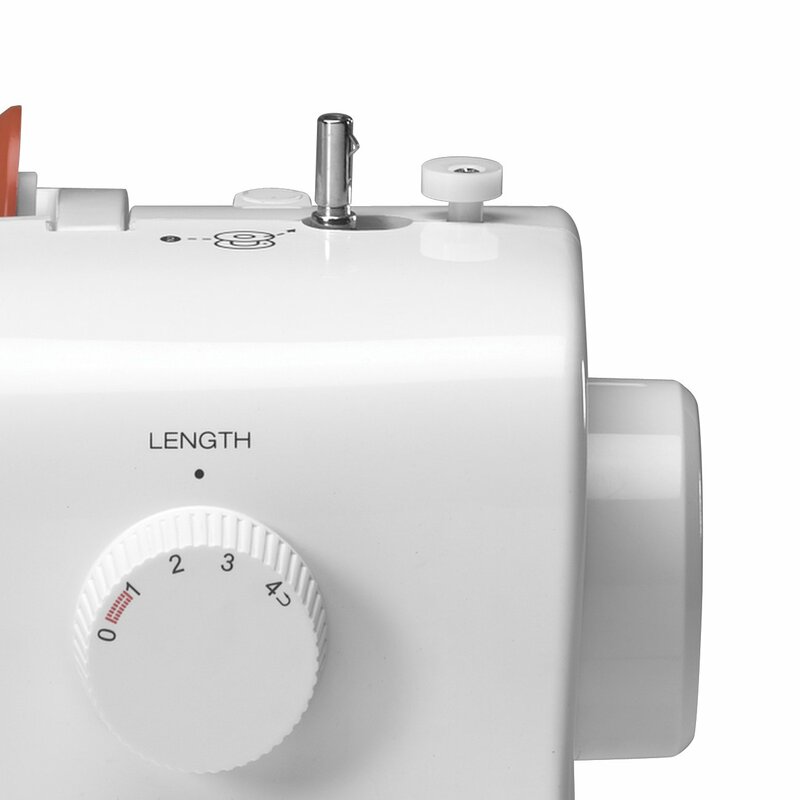 This diligent workhorse of a sewing machine comes with 23 built-in stitches. It is also equipped with automatic mechanisms for its needle threader and reverse. 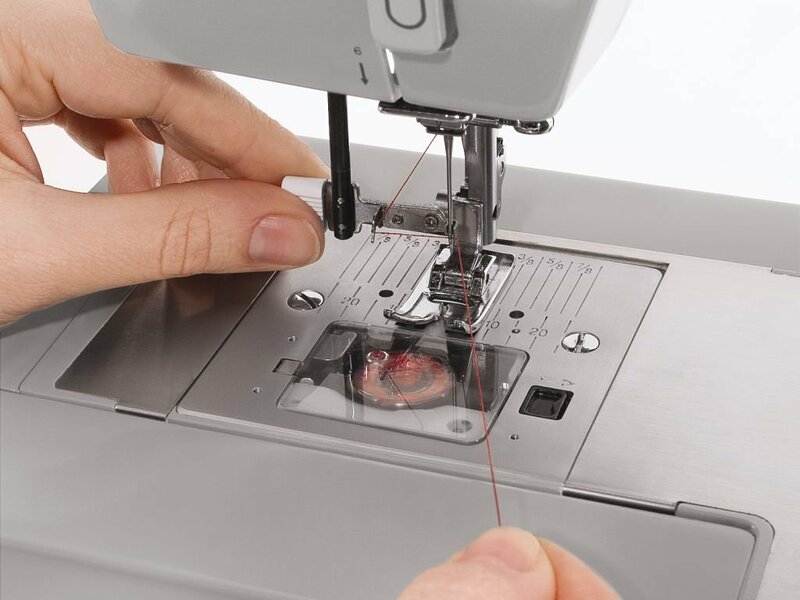 It offers great flexibility with its adjustable presser foot pressure control, stitch length, and three needle position options. However, what this sewing machine really boasts of is its strength. This strong piece has a heavy duty metal frame and a stainless steel bed plate, but most of all- it has a motor that is 60% stronger than typical sewing machines, making it the perfect fit for sewing heavy fabrics with great ease. All in all, this is a though machine. However, it could be basic for some with its 23 built-in stitches and manual operation. It may not suit those who are looking for more features to experiment with, or avid followers of everything digital. According to Singer’s website, this model promises everything a seamstress would ever need. With the claim “it truly has it all” Singer brand has gone beyond typical sewing machine capacities to create this model. Basically, this is a 12in x 8.2in x 7.2in electronically operated sewing machine that weighs around 20 lbs. It has a speed of 850 stitches per minute max, with each stitch measuring 7mm at max. This model boasts of 600 pre-installed stitches with 13 fully automatic buttonholes that have an exclusive buttonhole underplate. It is also equipped with an automatic thread cutter, needle threader, tension, bobbin winding clutch, and stitch length and width adjustment. Sewing at any lighting condition is made convenient by the 2StayBright LED lights that it comes with. It also comes with an electronic auto pilot mode and an automatic locking stitch function and reverse. 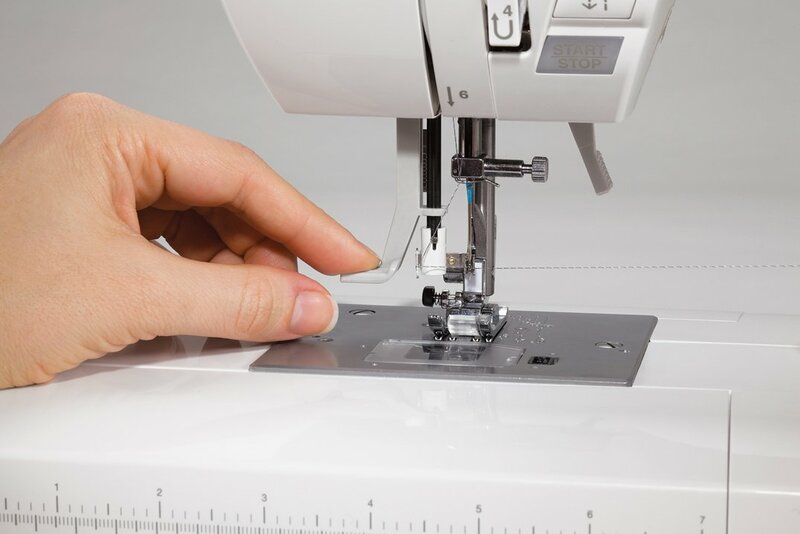 The list of extra features that this has never ends with its audible error warning, a stitch reference chart, and a mechanism that allows the sewing machine to adjust the stitching power depending on what is needed for the fabric used. There are a few more features that are not mentioned here, but all in all, the ones worth taking note of are stated. It’s hard to find flaws in a machine that was obviously built for perfection and all-around flexibility. However, with all the extravagant features that it comes with, this sewing machine is definitely on the heavy side of the spectrum. It could also be equipped with too much features that some minimalist tailors may never even use in their entire sewing career. After all, it wouldn’t be easy to go through 600 stitches. This sewing machine is made strong. With its heavy-duty chassis and most especially, its strong motor, it is made to work through heavy fabrics with great ease. 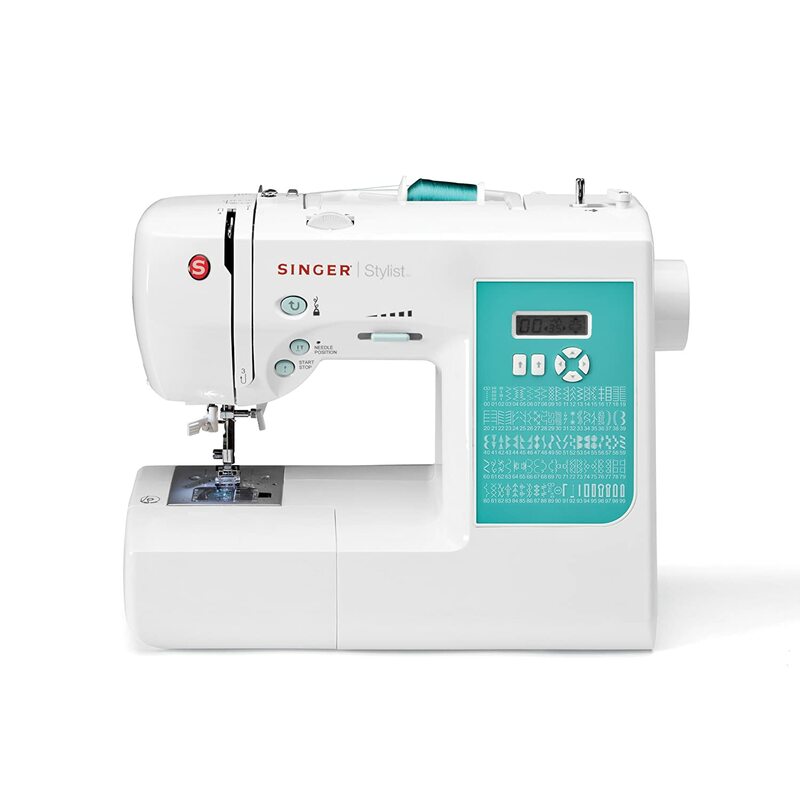 This machine may not be equipped with the long list of features that the Singer 9960 has, but it is perfect for anyone who is looking into creating various projects with heavier fabrics –or simply the choice of working with such without second thoughts. This is perfect for whoever is looking for standard stitching styles and features, and for more flexibility in fabric choices. It’s also perfect for those who love to work with great speed and ease, for this sewing machine will work its way through various projects smoothly. This sewing machine is perfect for the extravagant or the creative tailor. If you’re a fan of many options and flexibility in terms of project styles, then this will be the perfect choice. This is not only equipped with 600 built in stitches, it is also made extremely convenient to use with its automatic features: making it even a perfect choice for a beginner tailor looking for a long term sewing machine. Both machines are good but only one could be a perfect match for a person. If these two still aren’t the perfect fit for your needs, it’s always a great choice to see what other models Singer has in store for you. These two are proof of Singer’s dedication to great quality. I’m not one to fall easily for slogans, but I would be honest that this sewing machine initially got me for the price. I bought my sewing machine almost on a whim. I’ve lost weight recently, and as I was rummaging through my closet, I found it too hard to let go of the old clothes that I have. I thought of having each of them altered by a pro, but I also thought of how much money that would require. I then decided to look online for a sewing machine that could be my buddy in starting out. I made this review for other beginners like me who are looking for a machine to start with. There might be better ones or cheaper ones out there, depending on your priorities. But I’d say I have zero regrets in buying this, and I hope this review would enlighten you in considering your options. This sewing machine, for me, has affordability as its primary advantage. For a beginner like me, it isn’t easy to invest big money into something that I’m still looking into. Surprisingly, with the price that I paid, I’m still in awe at how sturdy and at the same time, lightweight it is. 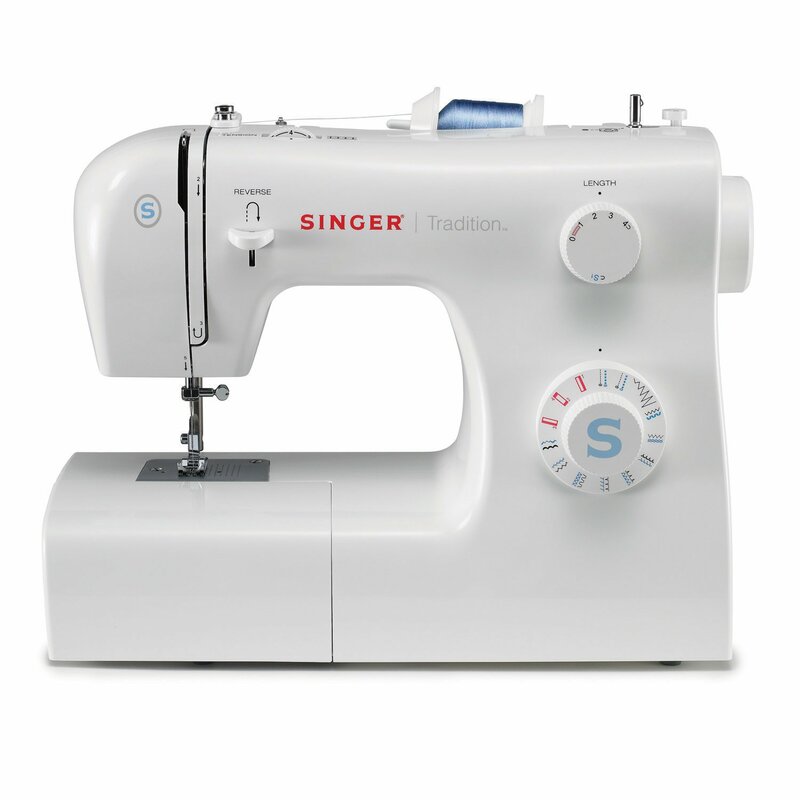 The Singer 2259 features a lightweight but sturdy sewing machine in a 15 x 6.2 x 12 in, 13.6 lbs package. It comes with 19 basic, stretch, and decorative built-in stitches that the user could choose from and could cover all basic and even quite the advanced garment alterations and even home improvement projects. It also comes with four snap-on presser feet, namely; all-purpose foot, buttonhole foot, zipper foot, and button sewing foot. In case in the future you discover that you need other kinds for a project, it isn’t hard to buy a separate one. 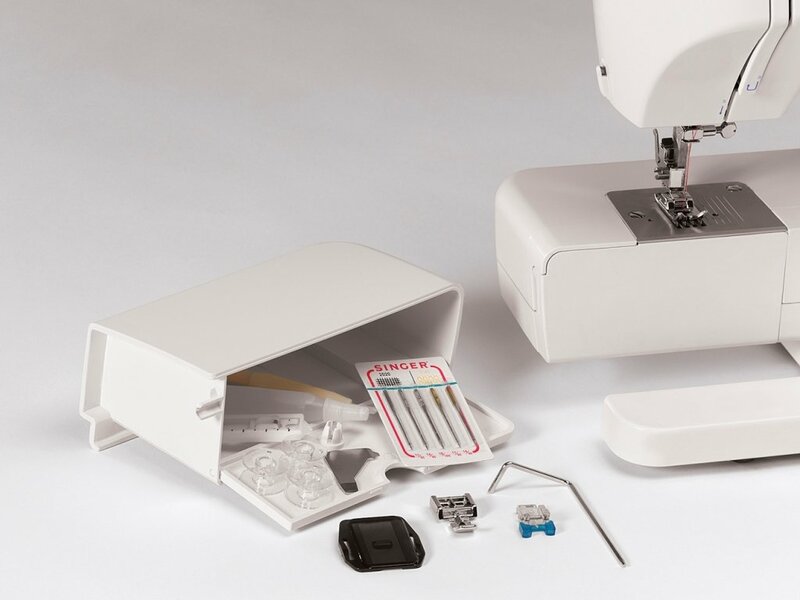 It comes with more accessories that could help in maintaining the sewing machine’s quality or simply make sewing easy. It has a soft dust cover, a screwdriver, a quilting guide for making even parallel stitches, three class 15 bobbins, two thread spool cap holders, six needles, darning plate, oil bottle, and seam ripper. Over-all this is a good buy for basic projects and beginners. It can sew light-medium fabric, but may have difficulty in dealing with heavy fabric like thick denim. I think it’s perfect for people who would like to try if sewing would fit them. It’s a good buy for testing the waters. Few of the little things that I like about it is its portability. It is lightweight and even comes with a handle. But despite its portability, it could still be easily setup to be stationary. It could be mounted on tables. Functionality-wise, the tension is good and I never had trouble in using it for simple projects like alterations. I even make my own pillow cases now! It also has a thread cutter on the side, and a replaceable LED work light. I have poor eyes, so this is a big plus for me. Lastly, it’s simple and sturdy. It has a metal frame. I’ve tried seeing the cheaper ones, but I really don’t trust equipment entirely made of plastic. Singer 2259 has some plastic parts too, but these are of good quality. I’m not careful, and it matters that there are still companies that mind the materials that they use for strong exteriors and body. My only regret is it is not entirely all-purpose. It’s could only be used for light quilting and I certainly wouldn’t risk having too much projects with heavy denim on it. So actually, I’m thinking of a more heavy duty sewing machine now for those purposes. Also, I don’t see and I’m very clueless if I’m running out of thread because I can’t see how much thread is left. Nevertheless, I consider this a really good buy. I suggest that if you’re keen on buying one, ask yourself of your intentions. I basically bought it to try it out. If it didn’t work out for me, I could’ve given it as a gift to a good friend or one of my aunties who loves sewing, so this totally worked for me. However, if you’re looking for something more long-term and well-rounded (although this I believe could be used for long-term too, just not for all kinds of projects) then I suggest for you to see higher end models that may have the same strength and may even offer more features.